Recently State Records staff from the Government Recordkeeping, Digital Archives and Archives Control and Management sections attended a workshop on arranging and describing archives run by the Australian Society of Archivists. The course was focused around the new challenges posed by digital environments, both in the creation of records digitally and in the way in which archives now operate. In order to address these emerging issues, we first discussed the way in which archive descriptive practices in Australia had developed. David Roberts, the workshop facilitator, explained the development of arrangement and description conventions that could adapt to the constantly changing nature of organisations producing records. There followed a lot of interesting discussion about the fact that now, not only was the organizational change continuing at pace, but that the nature and definition of the record was also something being debated. Attendees noted that modern digital records are often constituted from the interaction of many large databases, that technology supporting business records change rapidly, and that our tangible grasp on digital records is much less assured in as-a-service technology models. We also discussed that the sensitivity and complexity of the digital records is generally expanding rapidly: however, these are often not necessarily correlated with the value of the record long-term. Given the enormous quantity of records being generated, people agreed that prioritising certain records would be essential. We discussed techniques and technologies to automate as much of the descriptive process as possible, but noted that judgement and business knowledge remained essential in technology-enabled approaches. A big topic of discussion was the purpose of description. Many attendees argued that description of their digital collections was very much driven by providing access, and if a benefit to access was not clear, then enhancements to description would be unlikely to be done. Others noted that description of open-access digital records was able to be enhanced through an iterative feedback process based on use and user response, a well as be directly enhanced by end-user input. It was mentioned that government archives put a great deal of descriptive effort for archives that might not be publicly available for decades. For these organisations, demonstrating that their digital archives are well managed, and that they are secure, is a key outcome of description. Other attendees noted that description for this accountability eventually would enable access, and similarly that access-focused description brought about its own accountabilities. The government attendees agreed, but noted that it was sometimes more difficult to tangibly assign value to these accountability benefits. There was a lot of discussion about the application powerful descriptive frameworks, such at the WC3 RDF to describe archives, and their applicability to traditional descriptive tools including archival series and creating and controlling entities. 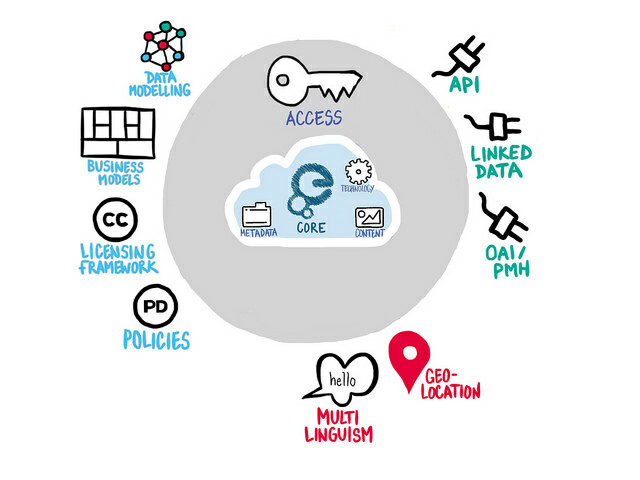 The power of these tools to drive discovery of resources across multiple repositories, enabling cross-institutional and cross-jurisdictional archival collections to be harnessed and presented as rich and multidimensional information, culture and heritage resource for users. It was also noted that the application of consistent frameworks to description allowed for enhanced accountability, and descriptive approaches and enhancement were also a key tool in cross-jurisdictional open data initiatives. It was great to see the sharing ideas across this diverse group of archivists. It is worth keeping an eye on the ASA events page for information about future events! Image credit: Europeana Conditions by Elco van Staveren on Flickr (licensed under CC BY-SA 2.0). « Change is constant – what does this mean for records and information?